We envision a world where girls and women lead inclusive, resilient communities, and where nature is accessible to everyone and conserved for future generations. Our organization is built on shared values of inclusion, integrity, empathy, creativity, and community. As the only nonprofit of its kind, GirlVentures combines outdoor adventure with social emotional learning for adolescent girls, at a critical time in their lives. Starting at age 11, our Leadership Progression Model builds girls’ confidence, skills, and leadership as they backpack, hike, kayak and rock climb in the Northern California wilderness. They learn from experiential educators and mentors, while building life skills that empower them to reach their full potential. Exploring identity, social justice, leadership, health, and the environment, our unique curriculum nurtures self-esteem and resilience, as girls develop into empathetic, confident young women who are conservationists and allies to each other. The transformational experiences that these girls share enable them to feel supported, find strength from one another and within themselves, gaining the skills needed to face the challenges of adolescence and making a difference in them that lasts a lifetime. To ensure that girls from all communities can access to our programs, GirlVentures utilizes a sliding scale fee structure, and provides all gear, food, and transportation free of cost. In order to address the systemic barriers that continue to prevent equitable access to the outdoors, GirlVentures operates within a comprehensive inclusion and diversity framework and promotes the advancement of alumnae in the outdoor education and environmental conservation industries. 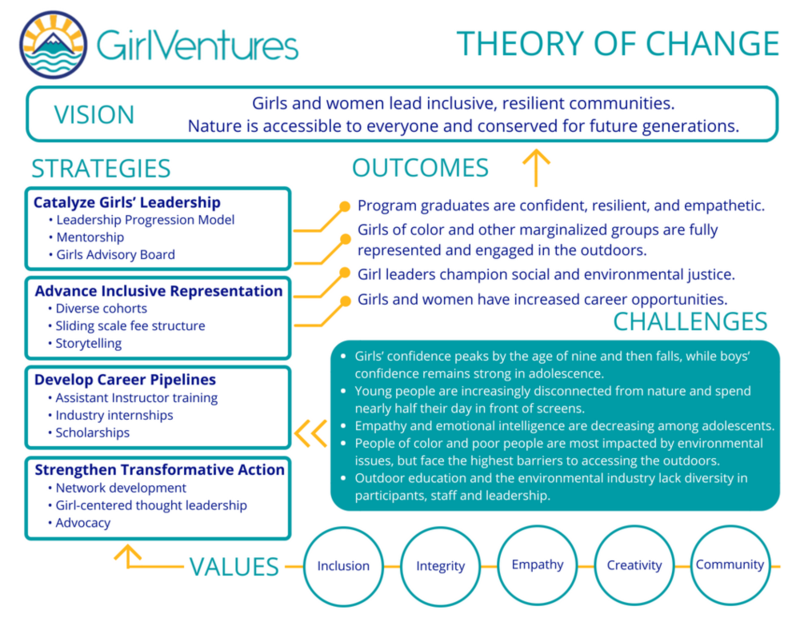 GirlVentures works to realize its mission by catalyzing girls’ leadership through outdoor adventure, advancing inclusive representation and developing career pipelines in the outdoor and environmental industries, and strengthening transformative action to support inclusive movements for social and environmental justice. Click on the image at right to learn more. GirlVentures was founded in 1997 by two Bay Area women who met at the Harvard School of Education, where they studied the transition from childhood to adolescence among girls.They found that girls faced multiple emotional, physical and social challenges and that underserved girls from marginalized communities in particular need extra support and mentorship to foster the self-confidence, perseverance, and sense of community needed for academic, social and career success. Outdoor education, they found, and single-gender outdoor education in particular, fosters the qualities that girls need in order to face the challenges posed by the transition to adulthood. GirlVentures was founded as the Bay Area Girls Center, before being renamed in the early 2000s. Since its inception, the organization has been proud to call San Francisco’s Mission District our home.